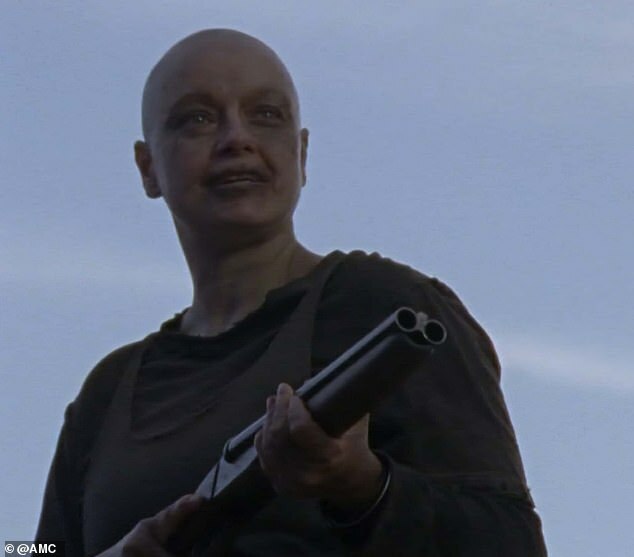 Alpha set a horrifically hard border after her daughter Lydia was granted asylum on Sunday's penultimate episode of season nine of The Walking Dead. 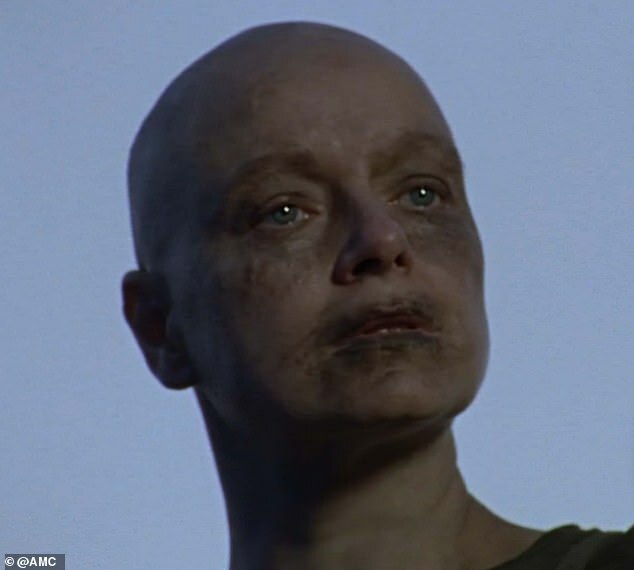 The episode titled The Calm Before ended with Alpha, played by 41-year-old English actress Samantha Morton, leaving a line of demarcation via mass decapitation. 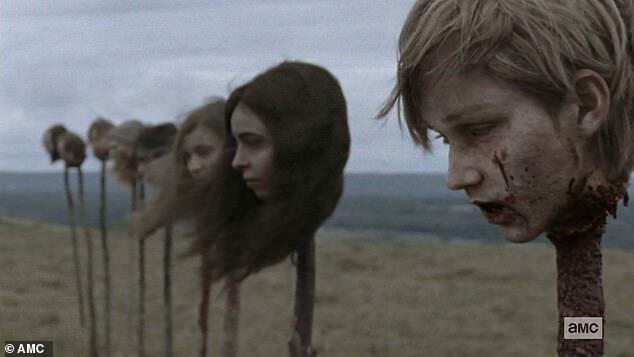 She placed spikes holding the severed heads of 10 survivors including Tara Chambler [Alanna Masterson], Enid [Katelyn Nacon] and Henry [Matt Lintz] to set a boundary for Whisperers territory. 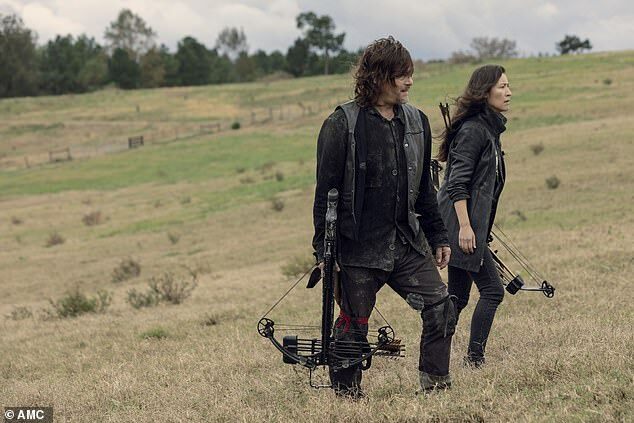 Alpha had previously captured Daryl Dixon [Norman Reedus] along with Michonne [Danai Gurira], Carol Peletier [Melissa McBride] and Yumiko [Eleanor Matsuura]. 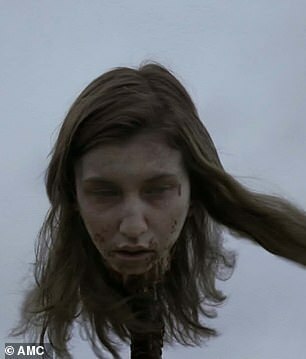 She singled out Daryl and lead him away to show him a horde of zombies in a valley. 'My people are among them. Steering them. The only reason you're alive is because I let you live,' Alpha said. 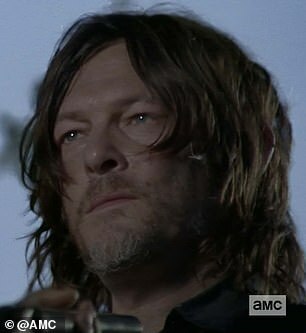 'What do you want?,' Daryl asked. 'I've seen how you live, I've walked your streets. A joke, a shrine to a long dead world. My people, the Whisperers, we live as nature intended,' she said. 'They follow me because I'm the Alpha and if the Alpha doesn't assert herself, there's chaos,' she said ominously. 'What'd you do?' Daryl said. 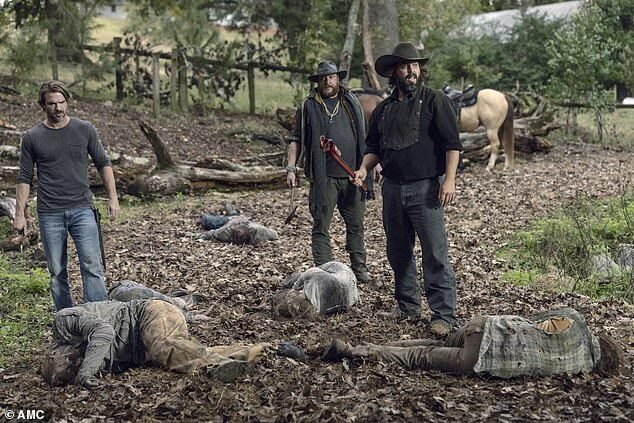 Alpha told Daryl that his friends were fine but warned him that next time they crossed into Whisperers land the horde of zombies would be unleashed. She then defined the Whisperers territory and told Daryl that a new northern boundary marker for his people had been set. 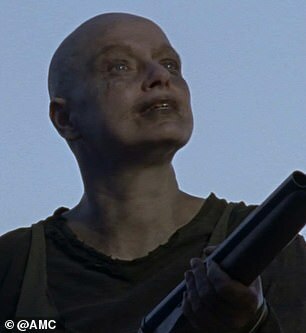 'You'll see it as you leave,' Alpha said before releasing Daryl. 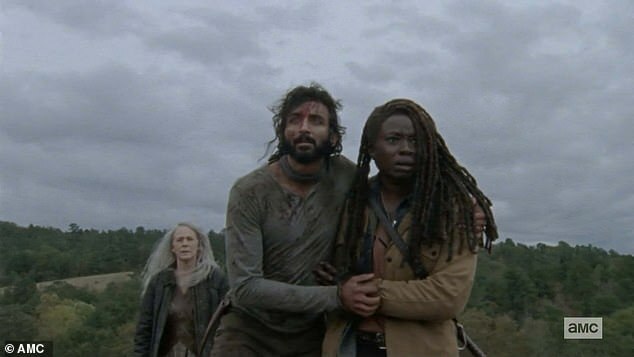 Daryl hugged Carol as he reunited with her, Michonne and Yumiko. 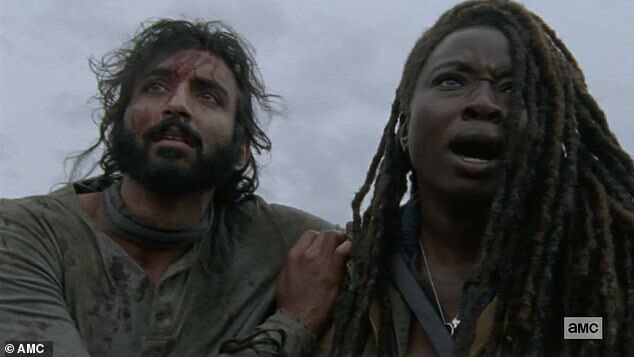 Michonne found Siddiq [Avi Nash] tied to a tree and he pointed them to a nearby field. 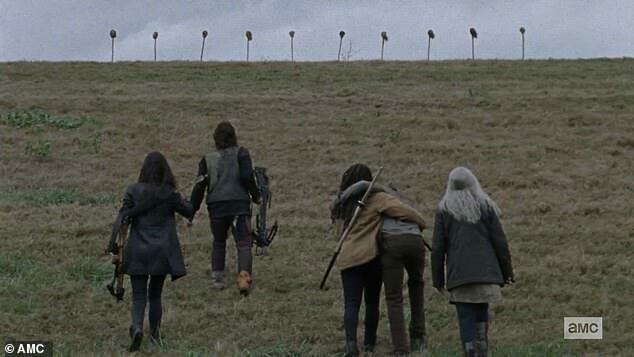 They saw spikes in the distance and as they approached started recognizing familiar faces atop the string of 10 poles. 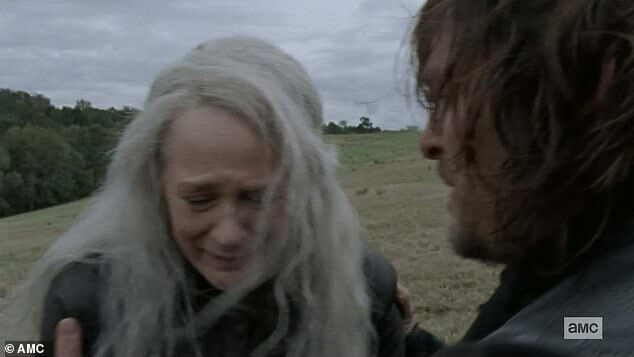 'Just look away,' Daryl said to Carol after seeing the head of her adopted son Henry on one of the pikes. 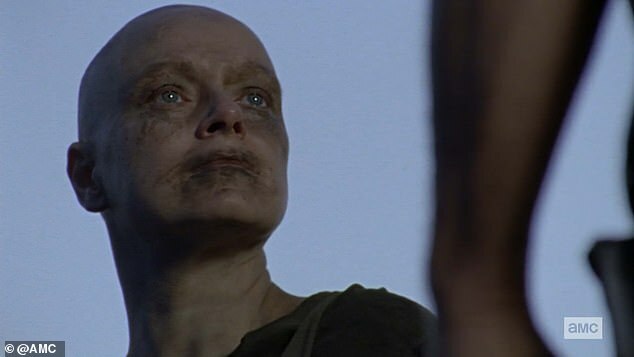 Carol however looked up and began sobbing at the sight of Henry. The next scene cut to The Kingdom where the multi-community fair was being held with Siddiq addressing the crowd. Siddiq said he was taken with the others and was 'supposed to die with them' and then Alpha whispered in his ear, 'Tell them' before he was knocked unconscious. The doctor said that Alpha wanted him to share that story 'to scare you and drive us all apart again'. 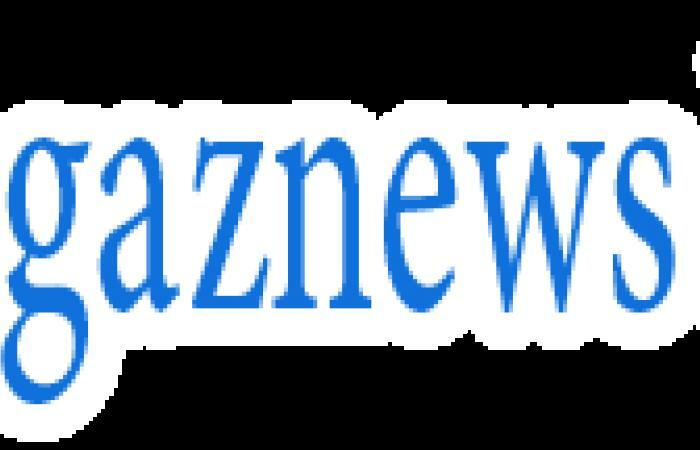 He told a different story of heroism and said that after they were captured that Ozzy [Angus Sampson] and his Highwaymen cohorts DJ and Alek found them and attempted a rescue. 'They gave us an opening and everyone fought back,' Siddiq said. 'They fought like hell. What they did was more than brave. They defended each other and sacrificed for each other,' he added.